Yakymenko, Fedir [Якименко, Федір; Jakymenko, also Akymenko], b 20 September 1876 in Pisky, outside Kharkiv, d 8 January 1945 in Paris. Composer, pianist, and teacher; brother of Yakiv Stepovy. At 10 years of age he was sent to Saint Petersburg, where he sang in the court kapelle; he studied piano with M. Balakirev (1886–95) and graduated (1900) from the Saint Petersburg Conservatory in the composition class of Nikolai Rimsky-Korsakov and A. Liadov. He then worked as a music teacher in Tbilisi (1901–3), Paris (1903–6), and Kharkiv before returning to Saint Petersburg to lecture (1914–23) at the conservatory. He emigrated to Prague in 1923 and headed the music section of the Ukrainian Higher Pedagogical Institute, Zinovii Lysko and Mykola Kolessa were among his students. He performed as a concert pianist, conducted choirs in tours through Western Europe, and prepared Praktychnyi kurs harmoniï (A Practical Course in Harmony, 1926). From 1928 he lived in France (Nice, Paris). 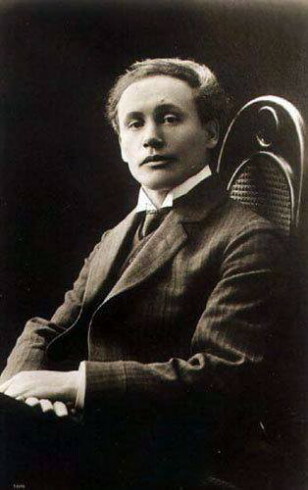 As a composer Yakymenko belonged to a 20th-century neoromantic school which was influenced by impressionist techniques. His major compositions were instrumental; they include two symphonies, symphonic poems, an orchestral suite, an overture, a trio for strings, a sonata for cello, sonatas for violin, and numerous works for piano (sonatas, sonatas-fantasias, Ukrainian Suite, preludes, and études). He also composed works for solo voice (notably to the words of Oleksander Oles), church music, and choir arrangements of Ukrainian folk songs. Many of Yakymenko’s works have appeared in German, French, Russian, and Ukrainian publications. His biography, by Pavlo Matsenko, appeared in Winnipeg in 1954.